It took me about two weeks to put together paint this one. Of course, there was a lot of work with GS to fill in all the gaps left after putting all the pieces together. I always pay attention to this aspect of working with Malifaux plastics as these gaps look really bad if not treated properly, especially on larger models. Another time-consuming issue was painting the moss. I didn't really know how work with it and experimented with various shades of green. In the end I used a few different colors for highlights, ranging from bright and very bright green to yellow. I wanted him to have a more natural look. Working on the wooden and stone parts was also a challenge as I wanted them to look distinctly different while still maintaining the swampy feel. I used fragments of wooden structure I had left over from the GW's Escape from Goblintown Hobbit set I worked on a while ago. 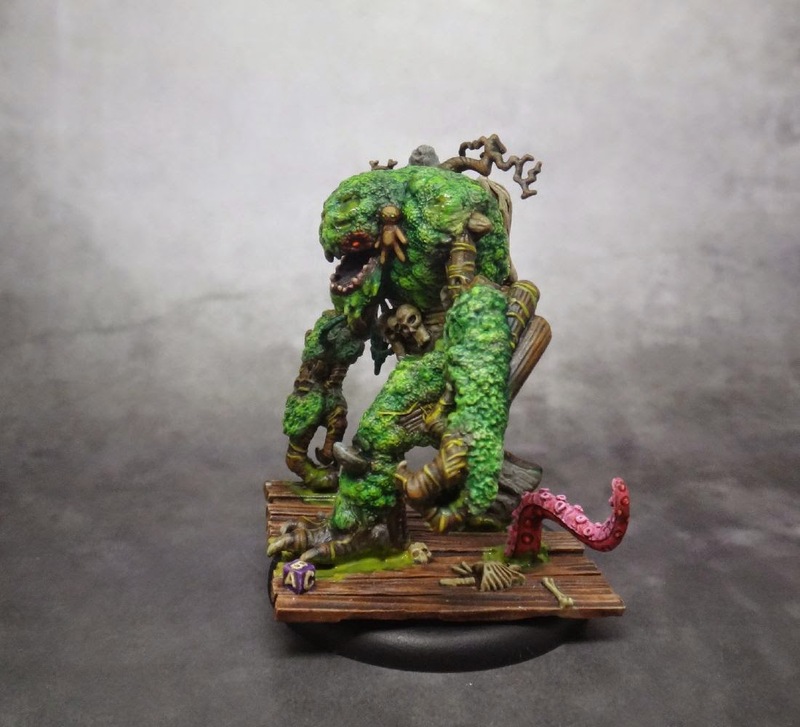 I painted it using the same color I used for my other Neverborn miniatures. I also added some other bits, such as as the brick from Wyrd Orphanage accessories and, to add a bit more color variety, a tentacle from Sewer accessories set. 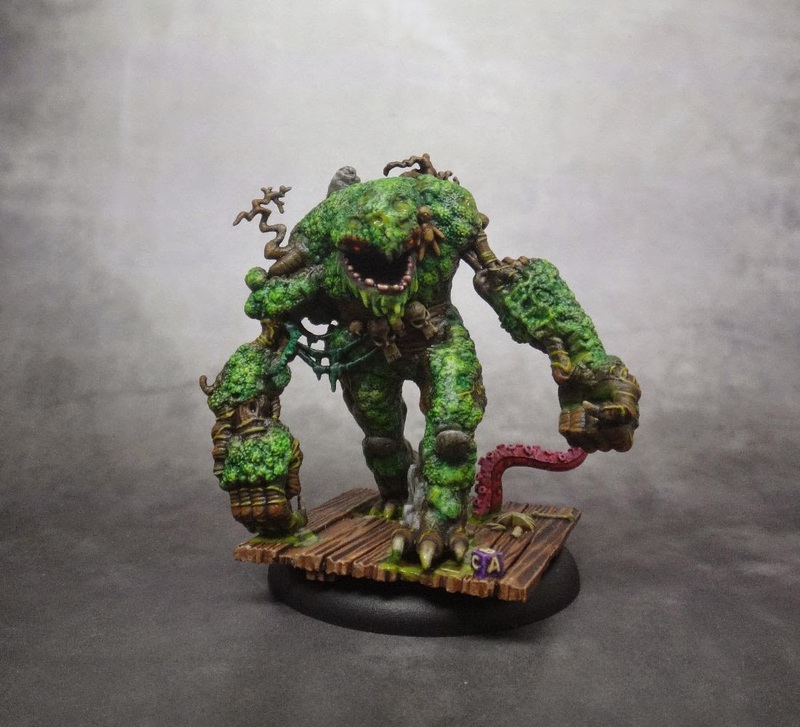 I also used Nurgle Rot to strengthen the swampy feel. Bad Juju is the epitome of the dark, ancient aspect of the Bayou. Cursed to die and rise again in an eternal cycle, and I wanted to make it look as if he was carrying part of it within himself. He is a scary melee monster. Not only his damage profile is high, but he also can use a nice trigger, paralyzing his opponents, or using Flurry to throw in three attacks. He also had a very good (0) action called Landslide. Anyone within 3' ho fails a 13 Wp duel, receives Slow and suffers 2 damage. His Df 3 is disappointingly low but he has other means of surviving. He is Terrifying, has 9 Wd but regenerates 2 at the start of activation, and he is also Hard to Wound. He also has an upgrade, Eternal Fiend, which allows him to return to game from death whenever a Swampfiend dies. 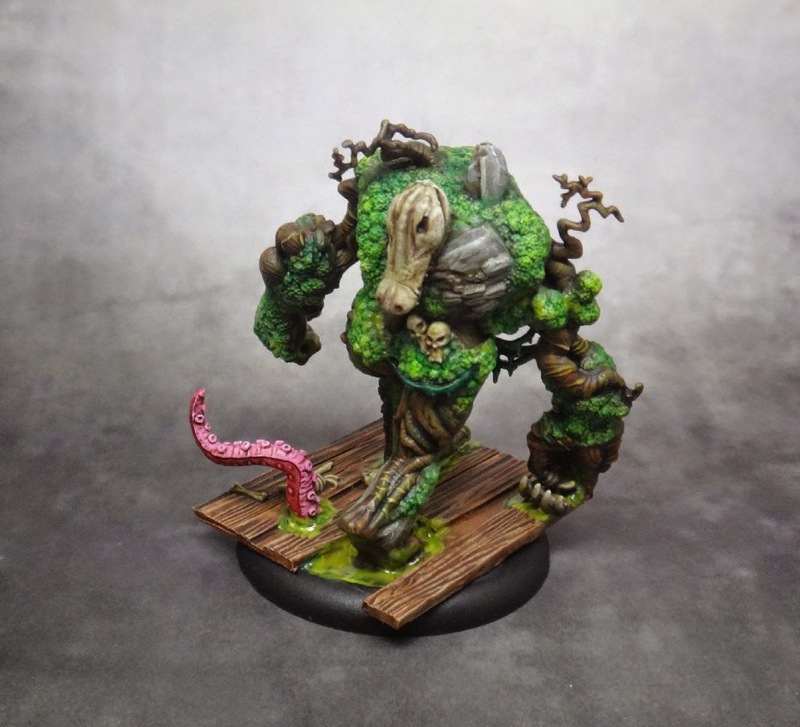 Another upgrade, Hexed Among You, allows other Swampfiends to be placed anywhere on the board that is at least 6' from enemy deployment zone. They can't take interact actions on first turn, but still it can set them up for doing so in turn 2 or put them in a good position to bring in Juju once they're killed. And here's another video of old Sepultura that I like a lot and that seems to go well with the theme of this model.